If you are Android Smartphone lover and wants to create your own unique name for your Android devices, now you can generate smart names for your android smartphone device. Android in its own way is a unique name and as well as Google name too because Google always try to named their products name unique. Many phone maker companies are launching smartphones with their unique brand names like Samsung Galaxy, Motorola Droid, HTC EVO, Sony Ericsson XPERIA, LG Optimus etc. etc. There is one website available online which is providing Tool to Generate Smart Names for Android Smartphones. 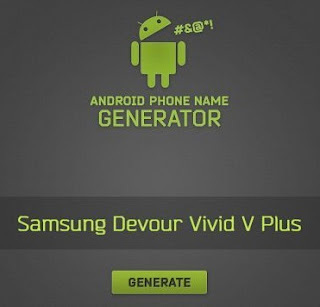 A website called itself Android Phone Name Generator through which users can have some fun by creating its own unique names for Android Smartphones. That website is using the real smartphone names and brands of all of the Android Phones that have been released so far and then generates a new name every time a person clicks on the "Generate" button on the website. Click here to Generate Smart Names for Android Smartphones Now.